Maruti Suzuki is the biggest player in the Indian auto market. With a variety of cars on offer, the company has made a name for producing cars which are practical, easy to maintain, fuel efficient and offer great value for money. Their nation wide service network also has been a boon for the crores who dr8ve their cars. Their new offering, the all new Ciaz is aimed to go against the likes of the Honda city, Volkswagen Vento, Skoda Rapid and Hyundai Verna. 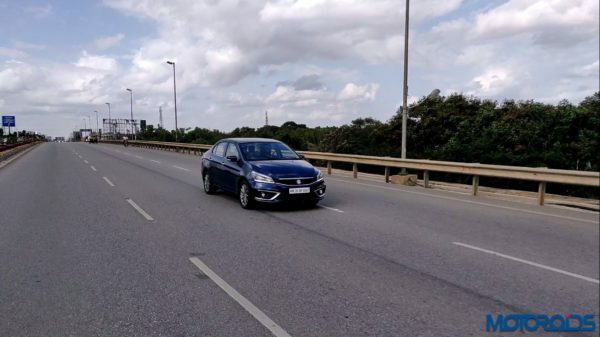 We recently drove the all new 2018 Ciaz facelift and are happy to report that we are very impressed. Read below for 2018 Maruti Suzuki Ciaz Facelift review. The all new Ciaz gets a revised new front grille with chrome accents on the top and bottom. The car features a new headlight unit with LED projectors and a new LED Daytime Running Light which adds aggression to the front face. Top end variants get a LED fog lamps which are surrounded some more chrome accents. The side profile of the car features Chrome handlebars with buttons in the front for key less entry/exit. Top end Alpha variant gets a 16 inch alloy wheel with a gun metal finish and is wrapped in 195 section tyres. Lower variants shall get a 15 inch alloy wheel and base models get a 15 inch steel wheel with wheel caps, both wrapped in 185 section rubber. The rear of the Ciaz gets all new LED tail lights which look phenomenal. 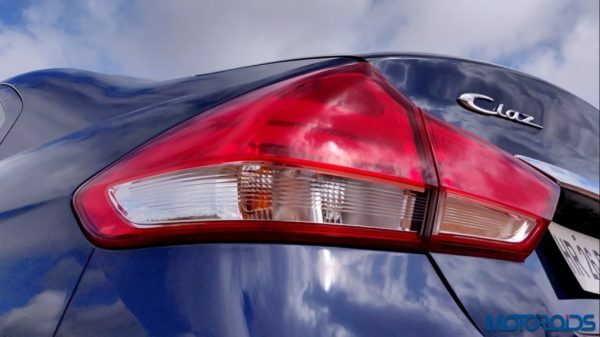 The red reflectors are located on the rear bumper and are surrounded by chrome accents. We Indians do love our chrome, so Maruti Suzuki added some more on the window sill. The boot is huge and can swallow up to 510 litres of luggage. Underneath the boot floor rests a 15 inch steel wheel with a 185 section tyre which does the job in case of a puncture. 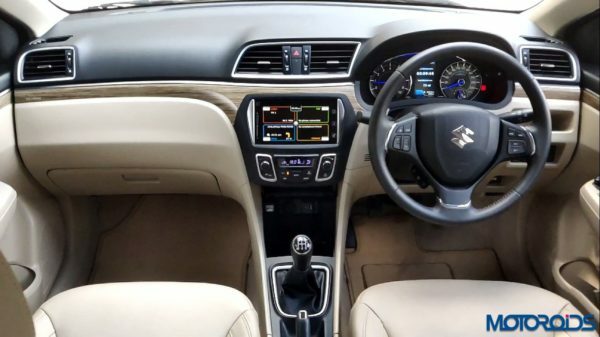 The interior of the new Ciaz is quite roomy and feels spacious. The Alpha variant gets leather wrapped seats and leather treatment on the door panels. The front seats are quite nicely finished and offer great support all around. The driver seat is height adjustable. The bolstering on the sides does offer great support. The rear seat offers great width and can fit 3 adults easily. The Ciaz does lack a tiny bit in the rear headroom department which can be a problem for people above 6 feet in height. The steering wheel feels nice to hold and has buttons for the infotainment system and cruise control. The ORVM’s are electronically adjustable and power folding, out of the four power windows the driver side window gets an auto up – down function. The dash is finished in a premium looking two tone paint scheme with black on top and beige on the bottom. The colour scheme is divided by a beautiful wooden finish trim and a satin silver accent which is seen to continue on the door panels as well. The headliner also has a storage compartment for your sunglasses. There are plenty of storage pockets spread throughout the car. The glove box offers decent space but does not offer a cooling function. 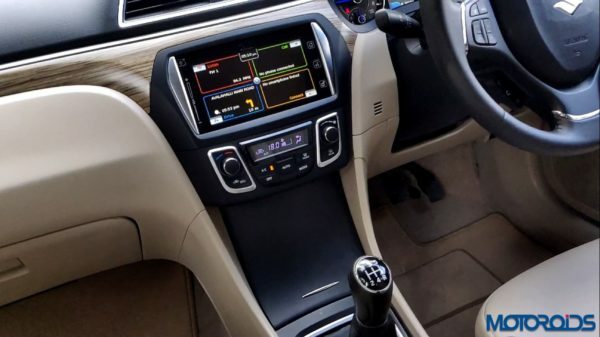 The car gets a 17.8 cm touchscreen infotainment screen which is android auto and Apple Car Play compatible, also functions as a display for the rear camera. Preparing in advance for the upcoming safety regulations, Maruti Suzuki have equipped the car with a host of safety features. Twin airbags, ABS and ISOFIX child seats are standard across all variants. As per the new upcoming norms, the new Ciaz gets a speed alert alarm, seat belt reminder and rear parking sensors. The inside rear view mirror gets an auto dimming function. The instrument panel gets a colour TFT display which displays a whole lot of information including a G-force meter, a real time power and torque meter, average fuel efficiency, etc which have been described in detail in the video below. The instrument panel gets LED highlights which change colour according to the speed of the engine. The Alpha variant also gets a smart key with a start/stop button and key less entry. The automatic variants also get ESP and a hill hold function. The new engine featuring in the Ciaz is a point of attraction. The all new 1.5 litre unit replaces the 1.4 litre unit found earlier. The power and torque figures stand at 103 HP and 138 Nm respectively sound very impressive but what has impressed us more is a claimed fuel efficiency of 21.56 kmpl in a manual and 20.38 kmpl in an automatic transmission configuration. The Smart Hybrid System uses a lithium ion battery to recover energy and provide assist during acceleration. The car is offered with a 4 speed automatic transmission which is made with fuel efficiency in mind and lacks driver involvement. There is no option to change the gear manually but a low gear selection is offered to tackle inclines. The old torque converter has started showing its age but does a decent job when driven in a smooth and relaxed manner. When given full throttle it can not keep up and the engine ends up making a lot of noise in the high rev range. The manual gearbox is much more engaging and offers more driver involvement. The high low end torque offered by the hybrid system is something that we love and we observe the car pull even fro as low as 500 – 600 rpm with minor splutter. The clutch is light and the gear knob has a short throw and the car is able to maintain its line while offering good stability. The suspension is on the softer side and the steering wheel is light. The steering on the manual variant somehow managed to give more feedback compared to the automatic. Overall the car offers reasonable road holding and control combined with comfort. So the all new Ciaz is aimed to an audience who are looking for an economical and reliable family sedan which is low on maintenance. The only car to come at a cheaper cost is the 1.4 Verna however it is not offered in the top end variants. The Ciaz is much cheaper than all of its rivals with the petrol manual variant ranging from INR 8.19 Lakh to INR 9.97 Lakh while the automatic comes at INR 9.8 Lakh to INR 10.97 Lakh. It undercuts the Honda City by as much as INR 3 Lakh for the top end automatic petrol version! The car offers a great package deal, performance is not the best but is not disappointing, offers best in class efficiency in the manual version and comes with peace of mind of owning a Maruti Suzuki car. If you are looking out for big family sedan, the all new Ciaz is definitely a car worth a test drive.